Supreme Court Opinions are available at the State Archives beginning with February 18, 1862. State Archives control number MVC-007. This is a numerical list of Nevada State Supreme Court Cases in the State Archives. The cases for 1865-1997 are indexed in Volume 45 of the Nevada Revised Statutes (NRS). The index in NRS refers to a volume and page number in the Reports of Cases Determined in the Supreme Court of the State of Nevada, also known as the Nevada Reports, which in turn refers to the case number necessary to find the case in the State Archives or the Special Collections Department at University of Nevada, Las Vegas Library. Nevada Supreme Court cases for all cases are available on microfilm at the Nevada Supreme Court Clerk's office at 201 S. Carson St.; Carson City NV 89701-4702; (775) 684-1600 (or in Las Vegas at (702) 486-9399) during the hours of 8:00-5:00, Monday-Friday. E-mail: nvscclerk@nvcourts.state.nv.us. The Clerk keeps the official record of the Court's actions and decisions. 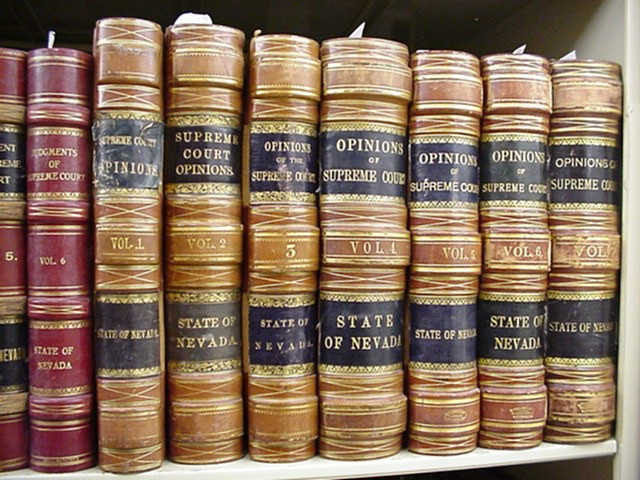 Nevada Supreme Court cases 1 through 2507 are available on microfilm for the years 1863-1921 at the State Library and the Special Collections Department at the University of Nevada, Las Vegas Library. The original, existing paper copies of cases 1 through 3208, from the years 1863 to 1937, are preserved in the State Archives. Original case files that are also available on microfilm may be researched in the State Archives, but not photocopied, unless the microfilm is damaged or unreadable.